No matter how large or small the gathering, how whimsical or conservative your tastes, the staff at Shiam Blossoms will ensure your important day is remembered as elegant and tasteful. 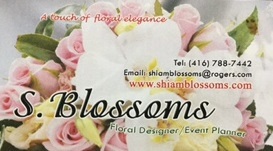 Shiam Blossoms supplies unique, elegant floral arrangements for weddings, bridal parties, religious celebrations and a variety of milestone events or just to embellish your home. As your floral consultant, we will design arrangements to suit your occasions, taking into consideration your own specific needs. With our vast experience in creating exceptionally beautiful settings, Shiam Blossoms offers you unparalleled professional service.We are a business that honors your commitments. THANK YOU Shiam for the great service you provided to make Terry and Rada’s wedding a beautiful and memorable one. Everybody commented how truly beautiful the floral arrangements were. I will never forget the high quality service you provided and the true professionalism you have shown during the most important day of our lives. Thank you for all your love and support towards our special day. The flowers were amazing – we could not have asked for anything more. 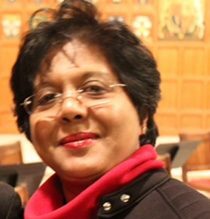 I am pleased to enclosure our cheque to cover the work for the Ryerson University Faculty Association on its annual Awards and Retires Reception and Dinner on May 4, 2005. This event is the highlight of our year and at Ryerson, and was held at the Marriott Courtyard Hotel. The work you did with the boutonnieres and corsages was of a very high quality and the faculty members who received them were delighted. However, the floral centerpieces which you provided were outstanding and unique. The hotel staff were happy to arrange the centerpieces as you had s carefully instructed, which made for a beautiful table settings. That was our first experience with Shiam Blossoms; the delivery was on time, and as we requested. You may be assured that we will use your services again, and we will certainly recommend Shiam Blossoms to other people. Congratulations on a job well done, and please accept my best wishes for success in your business. Thank you! I will give you proper pictures once I get the official pictures from the wedding and you can use them for advertising purposes if you wish. Thank you for a job superbly done! I couldn't have been happier! We can't thank you enough for creating such beautiful arrangements for our wedding and bridal party. We wouldn't have asked for anything better. Thank you so much for your beautiful flower arrangements. It was a magical touch to our wedding day. You did a great job! Shiam, I just wanted to say a HUGE THANK YOU! for all of your hard work on the day of my wedding. The decorations came out stunning. You did an amazing job and I thought you would like a photograph. When the professional one comes I will send you copies for sure of the church decor. The bouquet was beautiful as well. I am very grateful for you Aunty. God bless you.